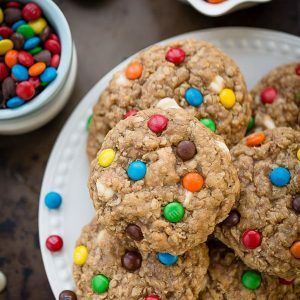 Soft and Chewy Oatmeal Monster Cookies are filled with peanut butter, oats, white chocolate chips, and M&Ms. In a medium bowl, whisk the melted butter and brown sugar together until smooth & combined. Whisk in the vanilla, peanut butter and then the egg until well incorporated. Pour the wet ingredients into the dry ingredients and gently mix together with a wooden spoon or spatula until just combined. Fold in the white chocolate chips and M&M's reserving 1/4 cup of each for topping if desired. Place dough in the fridge to chill for 30 minutes. Once dough is chilled, preheat oven to 350 F degrees. Line two cookie sheets with parchment paper or silicone baking mats. Using a large cookie scoop or measure and roll 2-1/2 tablespoon size cookie dough balls. Place about 8 balls onto prepared cookie sheet.